Our Lady of Victory commemorates the victory of Las Navas, where a signal victory was gained over the Moors by the courageous King Alfonso VIII, King of Castile. This feast day was mistakenly given in the text with the date of 1202, when it actually occurred in the year 1212. King Alfonso IX of Leon is also often cited, although it was actually his cousin, King Alfonso VIII of Castile, who carried this miraculous flag upon which there was a picture of Our Lady. There are many military historians who view this battle as one of the 50 most important battles in the history of the world. At the battle of Las Navas the courageous King Alfonso VIII, King of Castile, faced a huge army of one quarter of a million Almohad warriors who had invaded Spain from Africa. Knights from all parts of Europe gathered in Toledo in response to Pope Innocent’s proclamation of a new crusade. Ten thousand knights and 100,000 foot soldiers, they were far more men than the city could ever hope to contain, and so they set up their colorful tents all about the city. 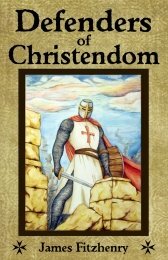 It was the most powerful Christian army ever assembled during the whole of the Reconquest up until that time, yet it paled in comparison to the Islamic host they sought to engage. King Alfonso remained with his reserves, and with him were the knights of the military orders. The valor of these knights was legendary, for they were skilled fighters who engaged the enemy caring little whether they lived or died. Their concern was only for the salvation of their souls, the honor of Christendom, and the greater glory of God. Above their heads floated the royal banner of Castile, and upon it an image of the Blessed Virgin Mary holding her infant Son in her lap. The banner had been given to King Alfonso after an apparition in which Our Lady had appeared to a sacristan at the Marian shrine of Rocamadour, ordering him to deliver the banner to the Castilian king. The sacristan had done so joyfully, and now that banner was held aloft near another banner depicting Christ’s Holy Cross. The battle began to the sound of trumpets as the two forces rushed together, and the floor of the valley shuddered at the tremendous impact. The fighting was fierce, and it seemed the Christians would lose the battle when King Alfonso plowed into the fray with his reserves. It was at that moment that a great miracle occurred. The king’s banners floated above the tempest that was but a churning sea of bodies, blades and bobbing helmets where King Alfonso had briefly cleared his way with deadly blows. No man bore either banner, for they were both now held in the invisible hands of angels. The banners moved, seemingly of their own accord, passing directly over the heads of the astounded enemy. They finally came to rest motionless in the air above Miramamolin’s own tent. The Africans fired arrows and threw stones at the banners, but try as they might, they could do nothing to harm the banners. Mary, Virgin Most Powerful, had claimed that camp, and there was nothing anyone could do to change it. A wail of despair rose to the skies, while desert warriors scattered and leapt aside. 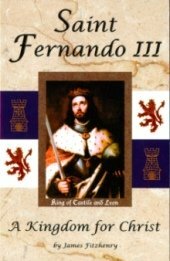 King Alfonso had seemingly come from nowhere to burst upon the very point on which the whole battle turned. The valorous king was prepared to die rather than be conquered, as his smoldering eyes gave evidence. It seemed to the Moors that an avenging angel had sped down to earth from the heavens, and like men gone mad with terror, they cast down their spears and began to flee in all directions, running wildly into each other. 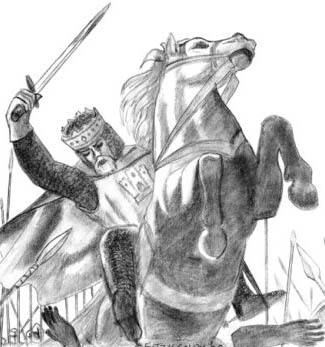 King Alfonso had fearlessly led his Christian army to an incredible, even miraculous, victory. Later that night the Sierras resounded, shaken by that hymn of thanksgiving raised up by the Church of Spain to the God of Battles.